Upgrade your old rusted metal baseboard registers and have these new ones shipped straight to you. New white vents on your baseboard can really freshen the look of any room. These metal baseboard registers have a solid steel core for unbeatable durability. On the white vents is a protective finish to protect the steel and prevent rusting. There is a louvered damper on the metal baseboard registers to allow adjustments to the amount of air flow. The white vents will project 7/8 inch from the wall. Installation hardware is provided with your metal baseboard registers for easy installation. The fins on your metal baseboard registers are spaced 1/3 inch apart for proper air flow. 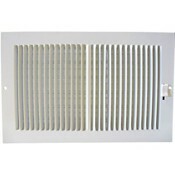 Use these white vents for both commercial and residential applications. Tip: Do not measure your old metal baseboard registers, measure the size of the wall opening to determine the size register needed. White vents are listed for the hole size they fit, total outside measurements can be found in the table above. Find additional metal baseboard register options. Have old white vents replaced in no time and see for yourself how big a difference new ones can make.